Polar heart rate monitors technology is so advanced that certain models can evaluate your current fitness level. Knowing where you stand will enable you to achieve your fitness goals with the least amount of time and effort. I'm sure you've heard the phrase "Train smarter, not harder". The use of Polar heart rate monitors will definitely help you train smarter. Polar Fitness Test - How Fit Are You? Certain Polar HRM models come with the Polar OwnIndex feature also known as the Polar Fitness Test. The Polar Fitness Test will make you aware of your current fitness level compared to others based on your age and gender. The Polar Fitness Test is done at REST therefore eliminating the need for a full cardiac load. The results of the test are displayed on your Polar monitor as a value. You then find your value/index on the OwnIndex® chart. Where your index falls in the chart allows you to compare your current fitness level to other people of the same age and gender. There are 7 categories of fitness levels. After a few weeks of training, you can perform the Fitness Test again to re-evaluate your fitness level. This new reading will determine if your mode of training is working or not. Now, that's what I call working smarter. Keeps You From Under Training or Over Training! The Polar OwnZone® feature found in certain models will evaluate your heart rate variability. It will then calculate your target training zones as a percentage of your heart rate max. These zones will be calculated based not only your training goals, but the Polar Own Zone® can also detect daily variations in your performance and mood. Therefore, if you are in good shape and relaxed the OwnZone® feature will adjust your training zones higher automatically. If the Polar heart rate monitor detects you in a stressed state (or oncoming illness) the training zones will be adjusted down accordingly. The Polar OwnZone® feature can do this because it monitors more than just your heart rate. It also measures your heart rate variability. To put it simply, heart rate variability is your hearts beat to beat measurement. It's rhythm. Similar to the timing of a car. Poor timing in a car can lead to a rough ride. Polar heart rate monitors are manufactured by Polar Electro. Polar was founded in 1977 and is based in Finland. The world's first wireless heart rate monitor was introduced by Polar over 30 years ago. Polar heart rate monitors are designed with a deep understanding of the needs and wants of today's athletes. Polar is the market leader in designing heart rate monitors to improve an athlete’s performance along with helping others achieve their cardiovascular goals as well as weight management. An important feature is that all Polar products have been developed based on scientific work along with the recommendations from the world's leading sports medicine authorities. There are 20 different models of Polar heart rate monitors to choose from. They are designed for general fitness, cross training, running and cycling. Therefore you want to purchase a heart rate monitor based upon your goals or specific sport. There is a brief description of the various models below. If you would like more details, click on the links for complete specifications. At the bottom of the page I will touch on the Polar models that I recommend and why. The recommendations are for the general fitness enthusiast. The athlete preparing for competition will have many more variables to consider and should explore each monitor in great detail to get the monitor that is right for their sport. The GET ACTIVE category of Polar heart rate monitors are designed for those going for a lunchtime run or a weekend bike ride. The GET ACTIVE monitors are considered BASIC heart rate monitors. This could be your first step into heart rate based training. Ideal for recreational exercisers who want an easy start to fitness. For those who want to keep their fitness training simple. It shows when you are improving fitness based on your heart rate. The Energy Pointer in this model tells you if you are training for fat burning or fitness improvement. For recreational cyclists who want to improve their cycling performance. These Polar models are designed to take your fitness to a new level. If your serious about getting fit, losing weight, improving your cardiovascular fitness, or improving your strength training, these are my top recommendations. Designed for the fitness enthusiast who wants to improve strength with weight training as well as improve their cardiovascular fitness. Connects to your online training diary at polarpersonaltrainer.com. Designed for the recreational runner to monitor speed, distance, and heart rate. This model includes the Polar Fitness Test which measures your aerobic fitness at rest and tells you your progress. 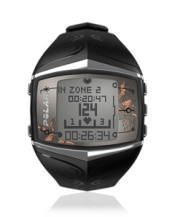 These Polar heart rate monitors are designed for the elite athlete wanting to reach the top of their game. If your serious about endurance, efficiency, and beating the competition in your specific sport, then these are the monitors for you. Advanced running features for the endurance athletes. Includes the Polar Fitness Test and helps the athlete train at the right intensity to avoid over training or inadequate training. Comes with Polar Pro trainer 5 software for analyzing, planning, and keeping a training diary. Maximum performance for endurance sports. Helps avoid over or under training by helping you to train at the right intensity. Includes the Polar Fitness Test and the Polar Pro Trainer 5 software for analyzing, planning and keeping a training diary. Advanced training capabilities for the cyclist. Measures your current, average, and maximum speed combined with your heart rate. Comes with Polar Pro Trainer 5 software for planning, analyzing, and keeping a training diary. Designed for those cyclists who compete and want to take their training to the next level. Determines your training and recovery times and improves your cycling techniques using your specific cycling data. The Polar Pro Trainer 5 software is included for planning, analyzing, and keeping a training diary. Limited-Edition for road cycling. Speed and cadence sensors are included for the serious cyclist. This Limited Edition training computer comes with a laser engraved ID number. Helps you to train at the right intensity, measures your heart rate combined with speed, and improves your cycling technique with cadence measurement. This would exclude the FA20 since it is not a heart rate monitor. Between the two cycling monitors, I recommend the CS300. You will need to purchase a cadence sensor separately if purchasing the CS300. The reason I recommend the IMPROVE FITNESS models for the general fitness enthusiast is because of the FEATURES. Don't get me wrong. If your under a tight budget, you can start with the BASIC GET ACTIVE MODELS. Something is better than nothing. However, I feel you can get better overall results when you can evaluate your current fitness level using the Polar Fitness Test and Polar Own Zone® features that are not available in all models. See the table below for Polar Heart Rate Monitor comparisons of the IMPROVE FITNESS models that I recommend.